When Samsung unveiled its current flagship Galaxy S6 and S6 Edge in March 2015, the South Korean tech giant went away from its signature plastic design and took a page out of Apple’s playbook by using premium materials, such as aluminum and glass, to finally give its users a high-end smartphone in terms of specs and design. A patent application from Samsung on the US Patent and Trademark Office reveals that Samsung is engineering something that seems rather remarkable. A foldable electronic device appears to be in the works, and it may be the upcoming Project Valley. As the patent indicates, Project V, aptly name to mirror the shape of the device in mid-fold, goes by model number SM-G929F. Although there are several foldable and rollable configurations shown in the patent application, the one most frequently shown is a horizontal clamshell, whose single fold opens in the same manner as a book or magazine. There is more than one way to orient the screens for a foldable smartphone. The device may fold in such a way that the two halves of the screen are touching when closed, like a book, or in the opposite configuration, where the screens both face outward at all times. 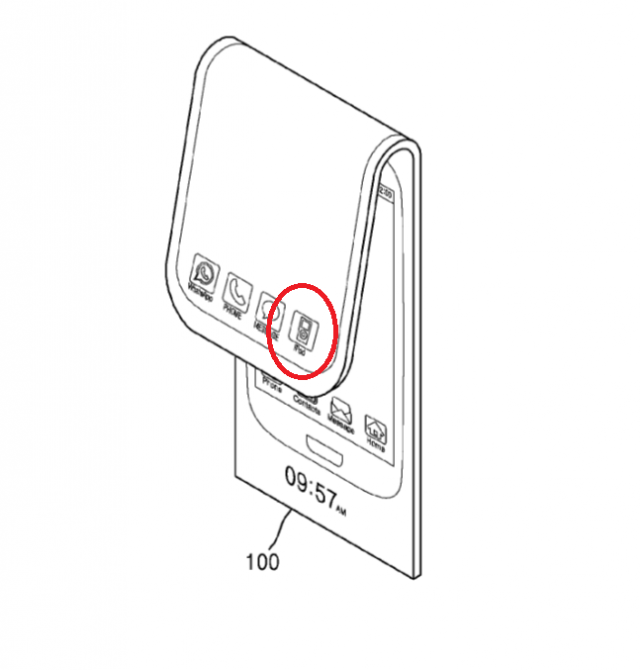 Samsung’s patent application was published earlier this month in the US and filed in May 2015. However, it was originally filed in Korea in 2014. Considering that this is a patent application, the timing of such a product to market is unknown at this time. That said, it is stated that Valley may be initially released in early 2016 in several European countries.